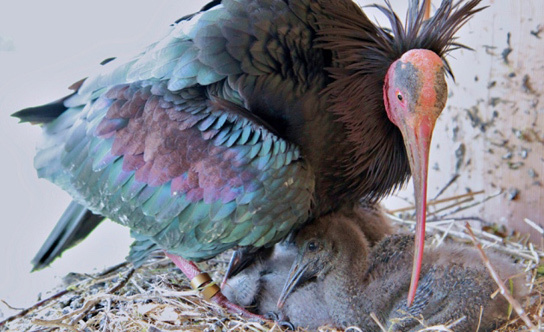 A rare species of ibis is part of a large European conservation effort, and the leading bird in this project was killed last weekend by illegal hunters in Italy. Goja, a northern bald ibis (Geronticus eremita), was in transit to her wintering grounds in Tuscany when she was shot down. G. eremita has been extinct in the wild in Europe for nearly 400 years, and is critically endangered in Northern Africa and the Middle East. Johannes Fritz, a biologist at the University of Vienna, and his team lead an effort to hand-raise the birds, teach them how to migrate from breeding areas north of the Alps in Germany and Austria to wintering grounds in Italy. Goja learned the migration route in 2009 by following an ultralight aircraft. The bird was the first of the team’s birds to fly back on her own to Germany for the summer. Aircraft-based teaching seems unconventional, but it could eventually help reintroduce the bird to Europe and aid the overall conservation effort. The scientists had made important progress with these birds. Until know, Goja was a key element in the team’s success since she was the first to migrate on her own. She was also the first migrator to raise chicks in the breeding area she came from, and the first to lead a juvenile, a male named Jazu, to the wintering grounds. Last fall, the project lost 15 of 37 birds to hunters in Italy. The team had to shift their focus from aiding migration to combating illegal hunting. Last Saturday, Goja was leading two juveniles. One was shot dead along her, and the other one is still missing. Jazu led a juvenile successfully to the wintering grounds this year. The birds are now being kept locked away until the end of the hunting season. 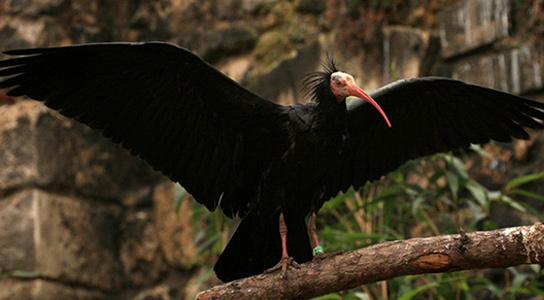 Be the first to comment on "Rare Northern Bald Ibis Killed Illegally By Hunters in Italy"